Engineering | Bracketry Systems, Inc. Designing compressor mounting kits at BSI has evolved from the time consuming, hands-on, “trial and error” method, to using a state-of-the-art, computer aided design (CAD) system called SolidWorks©. 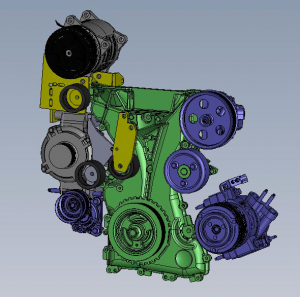 SolidWorks© allows our engineers to “see” where and how a compressor mounting kit can fit a vehicle before they see the vehicle. This takes the guesswork out of designs and significantly decreases design time. BSI also utilizes rapid prototyping to produce plastic models.